Whimsically humerous clockwork shorebirds with antique watch-part tummies and dangling legs, silver whale flukes on copper seas, winged beetles and shadow-boxed bees adorned with semi-precious stones, sea siren mermaids with moonstone faces, playful flowers in shades of metal, stones softened by the ebb and tide of the sea. All part of Rone Prinz’ collection of unique wearable art jewelry – Industrial Zen goes natural. We’d love to hear what you have to say about Rone’s work and her process. Leave us a message on our blog, and visit us at Seven Sisters Gallery. 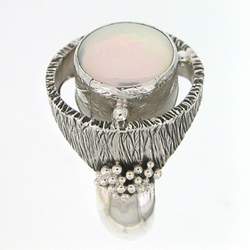 This entry was posted in The Artists, The Jewelry, Uncategorized and tagged metal and stone, moonstone, rone prinz, watch part on March 3, 2016 by SevenSistersGalleryCa. 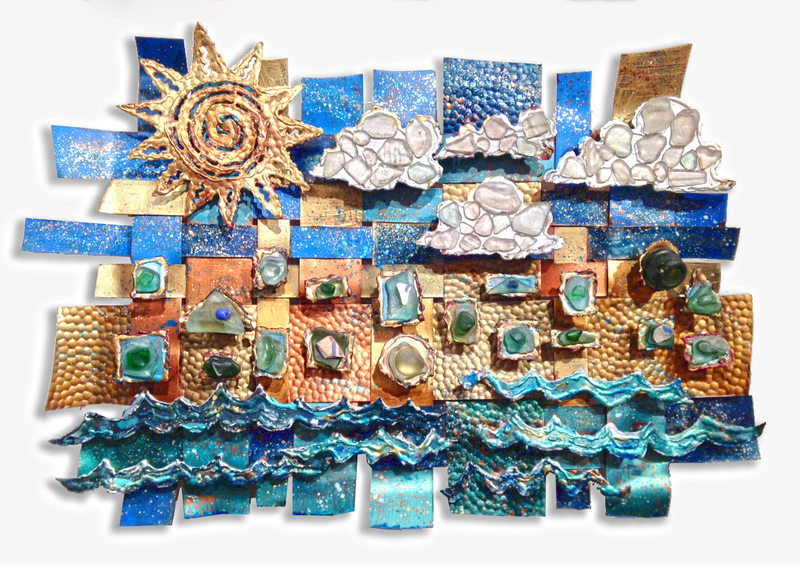 Trudi Gilliam is an artist who specializes in sculptures and mixed media art. 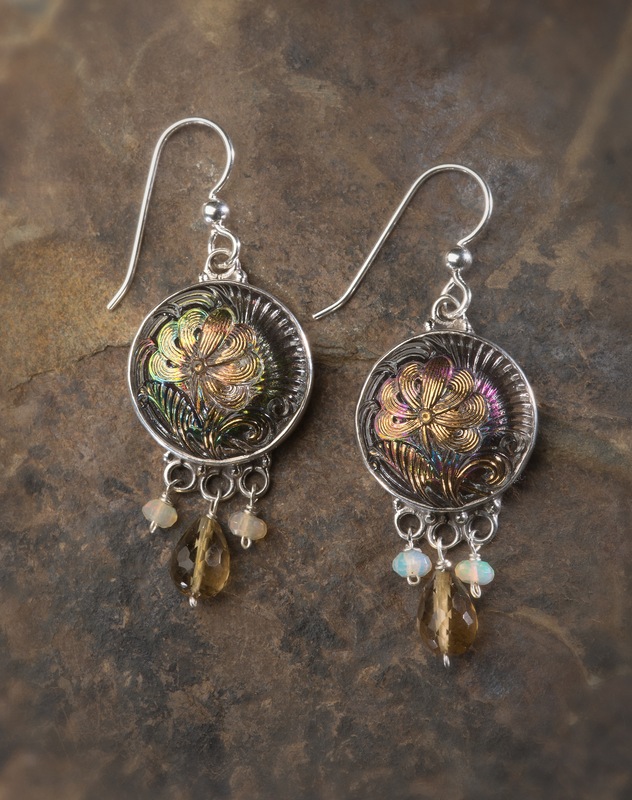 A graduate of James Madison University with a bachelors degree in Fine Art and a concentration in Sculpture, Trudi draws inspiration, for her one-of-a-kind, hand-crafted pieces, from the wild landscapes in which she travels and lives. As an avid fan of the ocean, and to get an even closer perspective of the sea and marine life, Gilliam received her scuba certification while living on St. Croix, where she has spent more than 25 years. Today Trudi shares time between St. Croix, the Central Coast of California, and her home in Montana. 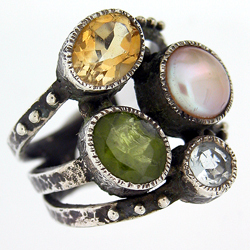 Gilliam makes frequent use of mediums such as copper and sea glass, as well as other metals like brass and silver, using them to create her works of art. Birds, flowers, and nature scenes are often the subject of Gilliam’s creations. One of our favorites is of a local treasure, the Piedras Blancas Lighthouse, which has recently reopened after extensive restoration. The Piedras Blancas Lighthouse is located at Point Piedras Blancas, meaning “white rocks”. The name is inspired by the large white rocks located slightly off the point, which mariners would use as navigational landmarks. In 1875, a lighthouse was built to further take advantage of the white rocks, which glowed bright when hit with the light from the lighthouse. After 10 months of construction, the 100 foot tall lighthouse was complete. Throughout the rest of the 1800’s and early 1900’s the lighthouse was in full use, although a handful of earthquakes began to shake the foundation of the lighthouse, and a large earthquake in 1949 forced the removal of the top 3 stories. 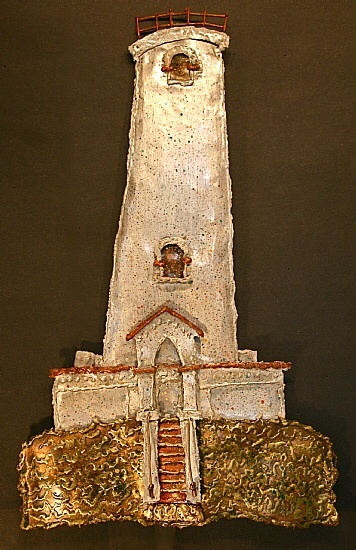 After the top 3 stories were removed, the lighthouse stood at 70 feet tall. Restoration is currently taking place, with goals to reconstruct the top 3 stories and return the lighthouse to its original height of 100 feet. Some of the completed restoration projects on the sight include the fog horn building, the water tower, and much painting of the original lighthouse. In addition, the landscaping has been redone to restore it back to how it was at the time of the lighthouse’s construction. The reintroduction of native plants has also lead to the increase in native animals, such as sea otters, elephant seals, gray whales, and many species of birds. The pearl, highly valued as an object of beauty for many centuries, has become a metaphor for something rare, fine, admirable and valuable. The symbol of wisdom acquired through experience. 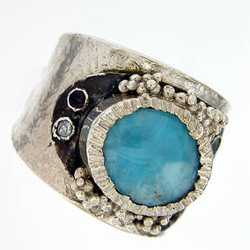 a hard, lustrous spherical mass, typically white or bluish-gray, formed within the shell of a pearl oyster or other bivalve mollusk and highly prized as a gem. a precious thing; the finest example of something. Unlike gemstones which are mined from the earth and then must be cut and polished to bring out their beauty, pearls are grown by live oysters, below the surface of the sea, and born complete. A natural pearl begins its life as a foreign object becomes lodged in an oyster’s soft inner body where it cannot be expelled. The oyster responds by secreting a smooth, hard, crystalline substance (nacre) around the irritant in order to protect itself. Encasing the irritant with this silky, crystalline coating until a luminously elegant and lustrous gem, called a pearl, is formed. 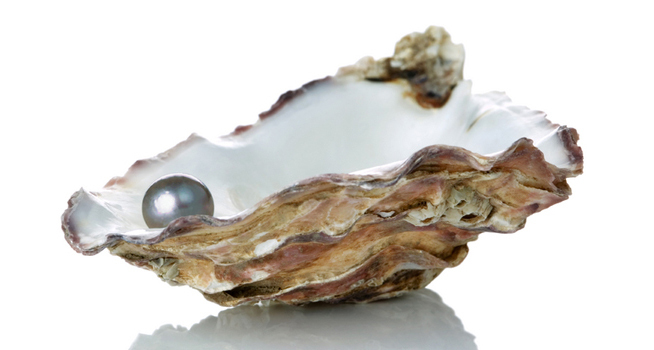 How something so miraculous emerges, out of an oyster’s way of protecting itself, is one of nature’s loveliest surprises and explains how the pearl has come to symbolize wisdom acquired through experience. While the most valuable pearls are perfectly round and smooth, many other interesting shapes also form and are known as Baroque pearls. Baroque pearls, especially during the Renaissance times, have been valued for their sculptural inspiration. 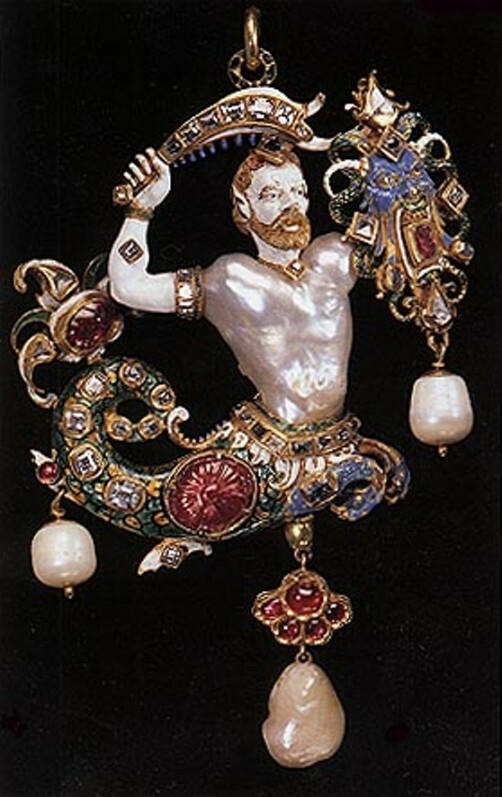 One example of this is the Canning Jewel, from the 16th century, which uses a large Baroque pearl as the body of a mermaid-esque figure. Today, Baroque pearls are a more affordable option than traditional, spherical pearls. And preferred by some for the way their irregular shapes inspire our imagination. But whatever your preference, from the spherical to the baroque, we’re sure you’ll enjoy our varied collection at Seven Sisters Gallery. This entry was posted in Uncategorized and tagged american artisan, art, artisan, bead, California, central coasts, jewelry, pearls on May 9, 2015 by SevenSistersGalleryCa. 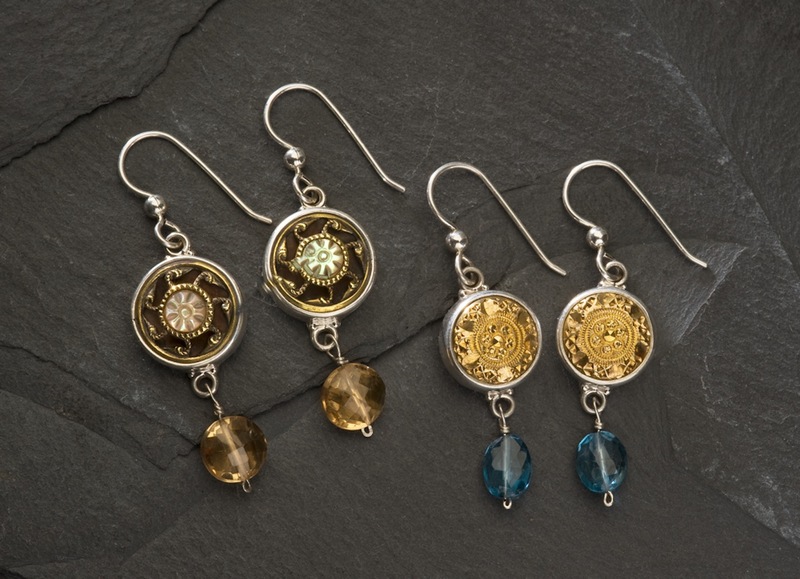 Elizabeth Ngo creates jewelry from historical works of art. Perhaps you yourself own one of these tiny historical pieces, thrown into a jar or the back of a drawer. You might have one or two tucked under your sofa cushion. The button. The simple fastener that fastens material and memories and generations. How many of us remember hours of entertainment sifting through button collections? Enjoying the feel of running our fingers through a pile spilled onto the floor. Marveling at the variety and detail. Turning to our siblings to say, “look at this one!” So often, as I stand with a customer, picking up this piece and that of the Ngo collection, I hear a story tied to memories of our mothers, our grandmothers, our younger selves. The simple button carries a sort of sacred quality that transports us to another time. 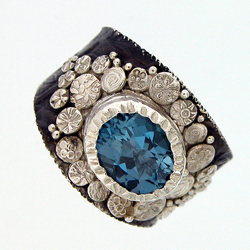 Elizabeth Ngo retains that quality by creating with great respect and attention to detail. 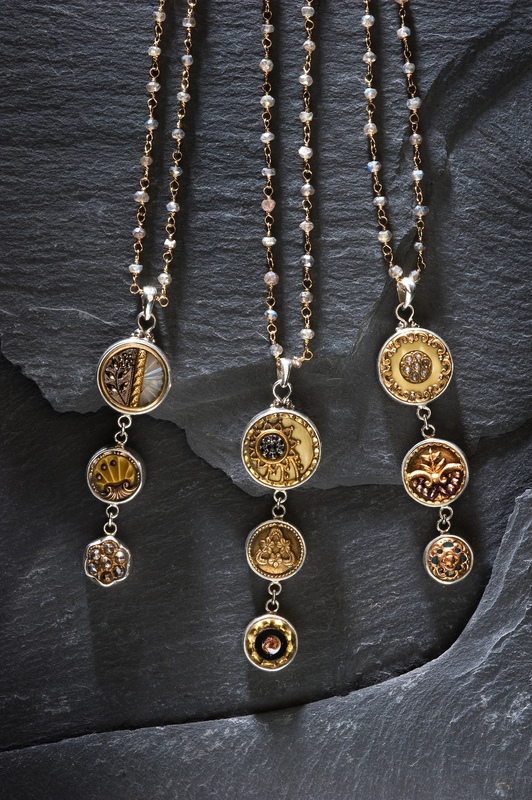 With a profound reverence for the historical significance of each piece, she maintains the integrity of the button by leaving the shank in tack. 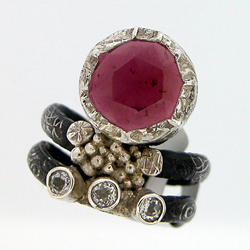 Setting the buttons in finely worked and beautifully detailed sterling silver to create wonderfully balanced rings, bracelets, necklaces and earrings. 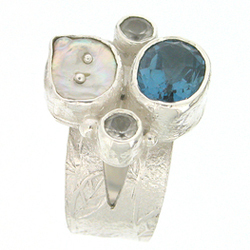 Adding details of Swarovski crystals and semi-precious stones and the finest findings. These elegant works of art reflect the era of the 1800’s in Europe. 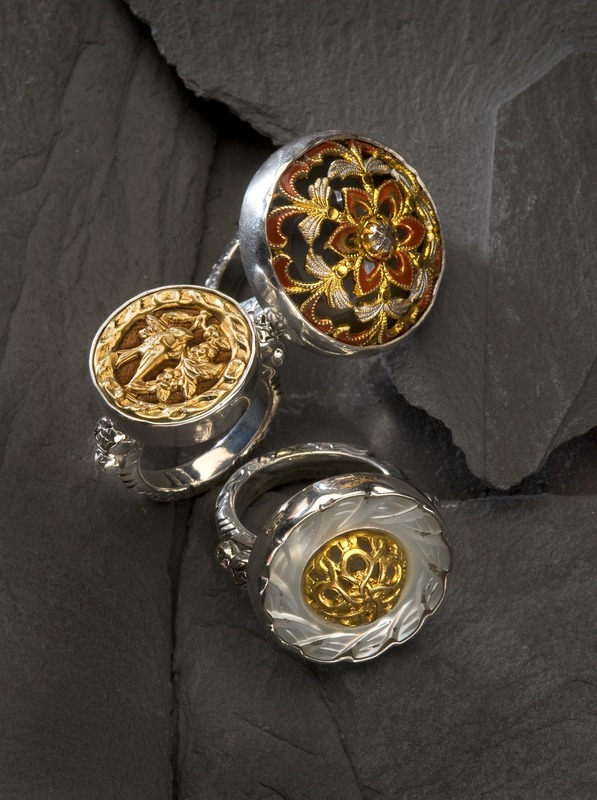 Whimsical characters, fleur de lis imagery, knights and battles, created with amazing enameling and intricate carving. Victorian glass, pearls and shells, ornate rhinestones and iridescent glass, all reflecting a time when art and history and handwork were highly revered. The history of buttons goes back at least as far as the Satsumas, highly collectible ceramic buttons from Japan. Named for a historic ceramics center on the southernmost island of Japan, Satsumas were first made in the 17th century by Korean potters. These buttons were often painted in extraordinary detail, depicting miniature scenes from Japanese life and the natural world. The brass picture buttons, which you’ll find in the Elizabeth Ngo collection, come from the Victorian era and are also highly collectible. 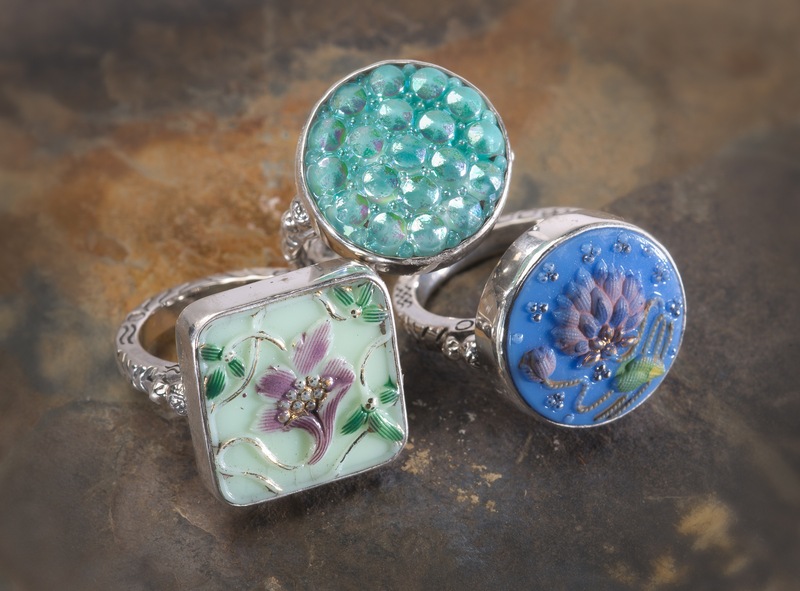 Delightful pieces, stamped with charming images inspired by everything from operas to children’s books. Other picture buttons took their cues from nature (flora and fauna), the sciences (stars and moons), or mythology (cupids and fairies). Black glass buttons from the Victorian era came next. Initially, black buttons were made out of jet, a fossilized coal found near Whitby, England. But because of the high cost of jet, black glass was soon used as a replacement. Some black glass buttons were molded to create reliefs of plants and animals, and detailed pictorials. Some of the buttons have reliefs of fabrics patterns; others have a stunning silver or iridescent luster. You might also find some that have been painted or enameled. 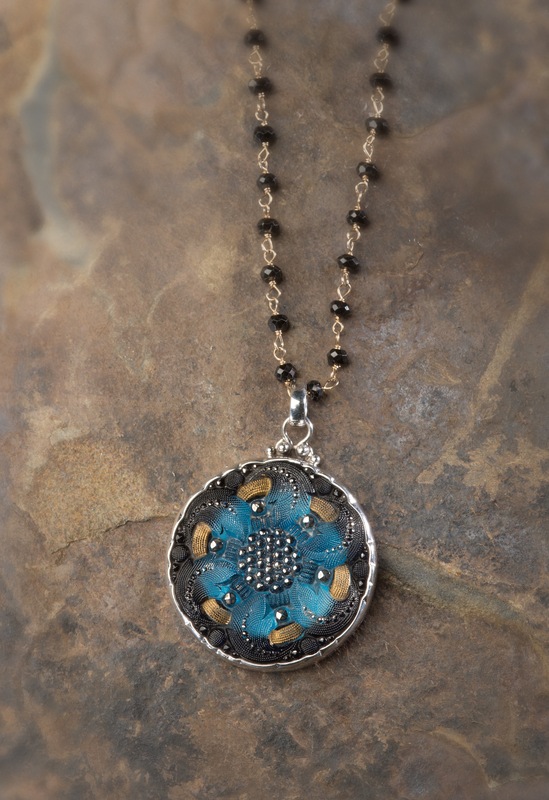 This entry was posted in The Artists, Uncategorized and tagged antique buttons, art, artisan, artist, bead, bracelet, button jewelry, create, earrings, elizabeth ngo, grandmothers, jewelry, mothers, necklace, precious stones, semiprecious stones, symbolism, uniting on May 3, 2014 by SevenSistersGalleryCa.